This work describes Techland, an OpenSim-based VW developed and owned by the author for educational purposes for middle school students. Techland is a group of islands focused on math, and science, where explore various approaches to VW, in different and mutually not exclusive learning sets and degrees of immersion. The main objectives are to simplify abstract concepts by using scripted 3D learning objects and to engage students offering a way to go beyond the classroom as the only learning environment. So Techland can be considered a giant 3D book. Activities range from viewing the contents of the world on an IWB, as a support for the teacher's lesson, to logging on the student's avatars into the world for exploration, producing machinima videos and collaborating together. Most islands are public access and reachable from other similar virtual worlds by the HG system, so other schools could take advantage from its contents or they could share projects. Techland has got the proper requirements to will become a meeting place between students and teachers who want to find new approaches to scientific matters. In this paper the author describes her experience focused on teaching math and science by employing a 3D virtual world based on Opensimulator. This 3D virtual world, Techland, has been developed by the author since 2010, in order to engage students (11-14 years old) and to facilitate learning, following generally a constructivist approach, similar to project-based learning. Techland is not a temporary project but a daily modus operandi. The logistic organization, training activities, learning set used and main projects are described here, especially those carried out in a collaborative way. Particular emphasis is given to the 3D interactive learning objects, the strongest points of Techland, used as 3D paragraphs showing information and mathematic and scientific properties when clicked by students. Regarding the students’ interaction and relationship, the author is focusing on the difference in “living the world” and collaborating between middle school student and high school/University students. Key findings and educational implications are discussed. 3D virtual worlds offer many opportunities for teaching and learning, as constructivist learning platforms (Gül, Williams & Gu, 2012). Wilson (1996) defined a constructivist learning environment as: “a place where learners may work together and support each other as they use a variety of tools and information resources in their guided pursuit of learning goals and problem-solving activities”. According to Wilson, thinking about instruction as an environment gives importance to the place where learning occurs. In this space learners can use different tools and devices to collect and interpret information (exploration), communicate and interact with other learners (social dimension of learning). In such environment, teachers have to provide adequate resources and tools to support and foster learning, not to control it. In the constructivist learning environment learners are engaged in “meaningful, authentic activities that help them to construct understandings, and develop skills relevant to problem solving”. According to social constructivist views, Jonassen (1999) has developed a set of principles for the design of constructivist learning environments that facilitate the construction of knowledge. A relevant and engaging problem or project to be solved or completed by the learner is the focus of the constructivist environment. The teacher is an instructor, a coach who prepares cognitive tools, also technology enhanced. In addition, a teacher also provides a rich information environment in order to help students to interpret the multiple perspectives of the problem as well as he analyzes the strategies used by them to solve it. Information must be learner selectable, relevant and easily accessible. The teacher also provides communication/collaboration tools. So the educational objectives are not imposed, but they are the result of negotiation between teachers and students. Central to the educational philosophy of Jonassen (2000) is the concept of mindtool: “Mindtools are knowledge construction tools that learners learn with, not from” (Jonassen, 2000). Spreadsheet, visualization tools and other programs help students construct their knowledge. 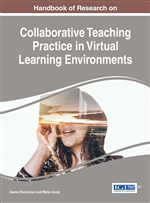 After having analyzed published research spanning about 20 years, Dalgarno and Lee (2010) identified a set of unique characteristics of virtual learning environments (VLEs) that can facilitate learning, particularly spatial knowledge, situated and experiential learning, increased motivation and effective collaboration learning. In addition, for a significant learning, it would be better if students had the chance to explore and manipulate within the environment or to communicate with one another (Dickey, 2003). Dede (1995) has claimed the advantage to combine VEs with the computer-mediated communication tools to promote collaborative learning, learning by doing and environment personalization as today’s multi user virtual worlds, including Techland, do. Problem based learning (PBL) is directly related to constructivism and it has been widely adopted in online educational setting (Pearson, 2006). PBL call for an active approach and it is based on solving real-life problem investigating in small groups. (Boud & Feletti, 1991).